I have been curious about the city of Istanbul for a long time. I still remember way back in the nineties playing a children’s computer game that consisted of tracking a missing dog all over Europe, traveling to many major cities, and ending up in Istanbul, which felt so different from the rest. It just seemed so exotic and mysterious. When I got older, I played the classic strategy game Age of Empires II, in which some campaigns were set in and around the medieval city of Constantinople. There’s just so much history there, as three different empires have ruled from it. In college, one of the best professors I had was a Turkish native, and he had lots of positive things to say about Istanbul, including that the idea that the city is dangerous because it’s predominantly Muslim is a misconception. A majority of recent terror attacks have actually taken place in Western European cities like Paris, Nice, Amsterdam, Brussels, etc. 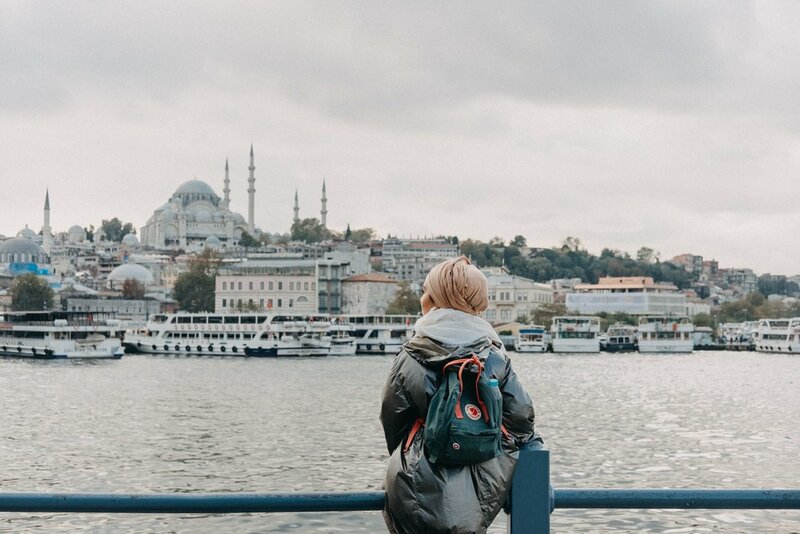 Istanbul has seen its fair share of jihadist attacks in recent years, and is by no means the safest place on the planet, but I wasn’t going to let fear hold me back from experiencing the things I wanted. Another interesting thing to note is that Turkey is officially a secular republic, rather than an authoritarian theocracy like Iran. I had the opportunity to travel to Turkey in the fall of 2017 with my sister, and we stayed 9 days in Istanbul, and 4 days in Cappadocia. My goal was to experience and photograph historic sites from Antiquity and the Middle Ages, as well as capture street life that epitomized local culture. The majority of this post will consist of that content, organized by geographical locations. 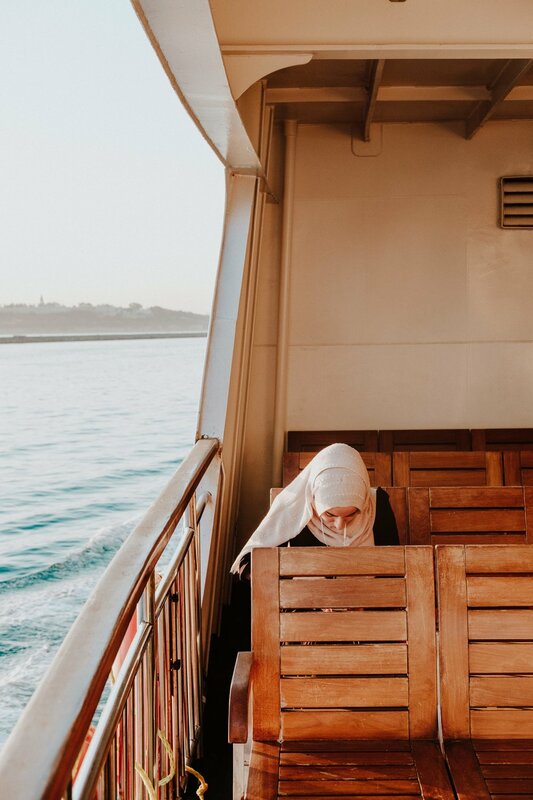 One of the first things that was immediately apparent is the ubiquitous Ezan, or call to prayer, that happens five times a day, including one in the wee hours of the morning right before sunrise. 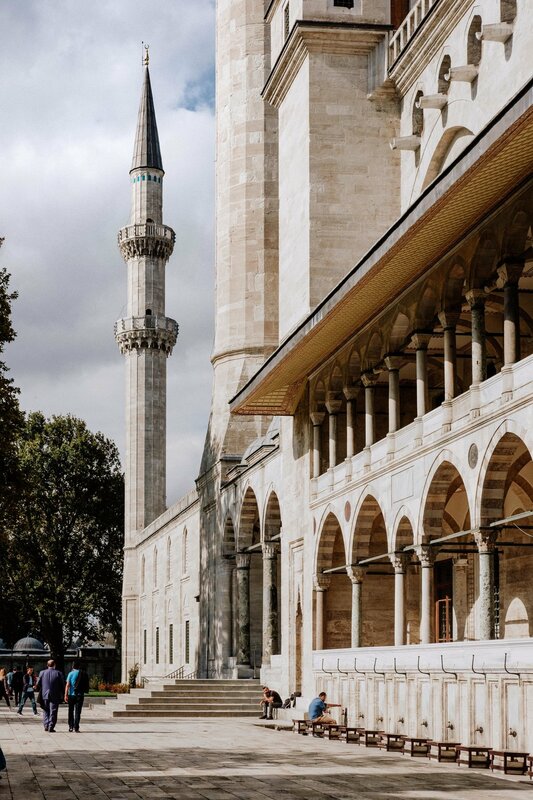 The first place we stayed at in Istanbul was in the heart of the old city, pretty much right across the street from the famous Sultan Ahmet Camii, otherwise known as the Blue Mosque, and it seemed like the loudspeaker blaring the call was pointing right at us. The first places we visited were the Blue Mosque and the Hagia Sophia, the latter of which was previously a Greek Orthodox cathedral during the Byzantine era. Even though the Middle Ages was only a few centuries ago, and I have been to much more ancient sites than these, I was still completely awed by the fact that I was walking around and standing in such iconic buildings from history. The Blue Mosque functions like any other mosque, with the majority of the space being dedicated for prayer and worship by Muslims only. The Hagia Sophia, however, has been turned into a historic museum. While we were there, unfortunately much of the interior was obstructed by scaffolding, but it was still majestic. There are dozens of mosques in Istanbul, but we only visited one more before getting all “mosque’d out”. This was the Süleymaniye Camii, a very large but less-touristy moque, also in the old city. Istanbul is quite a sprawling city. We mostly hung out in and around the old city (the land on which Constantinople once stood), on both the European and Asian sides, which was actually a lot of places, but but we still only saw a fraction of the whole city. We never even set foot in downtown, which was quite a ways north of where we were. Admittedly though, we ended up revisiting a lot of the same areas because of their central locations. 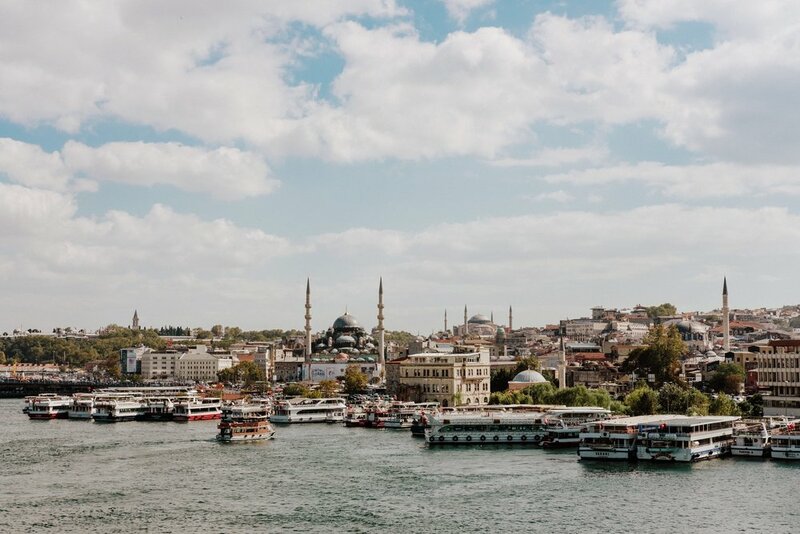 For example, Eminönü was the area right along the waterfront in the northern part of the old city at the intersection of the Golden Horn and the Bosphorus Strait. Two pedestrian/lightrail bridges extend north across the Horn, and various ferries take passengers across the Strait to the Asian side. We ended up passing through here a lot. Across the horn, directly north of Eminönü is Karaköy. This neighborhood predominantly consists of boutique clothing retailers, restaurants, and cafes. I also enjoyed visiting the Istanbul Modern art museum. The week we were there happened to be right in the middle of the Istanbul Biennial, so lots of museums and art galleries had special exhibits. 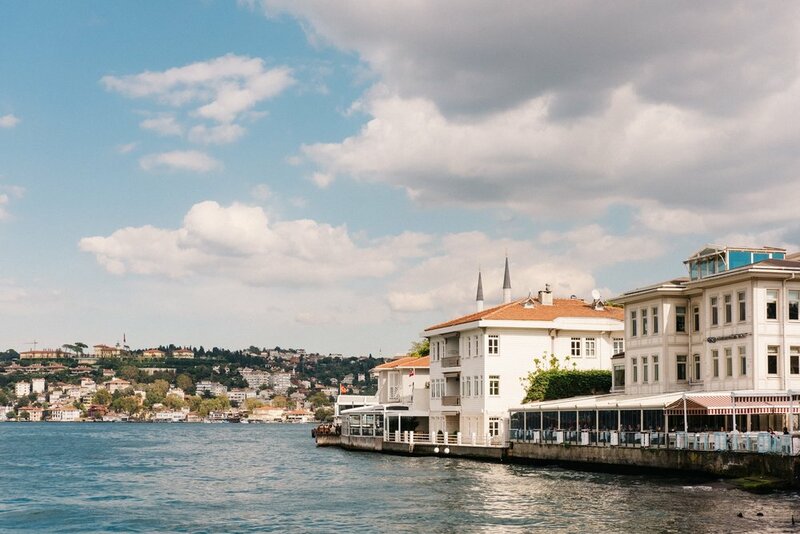 Adjacent to Karaköy is Galata, which has a similar vibe, but also contains the famous Galata Tower, as well as the SALT Galata library/gallery. North of Galata are Beyoğlu and Taksim Square, where we stayed for the second half of our time in the city. 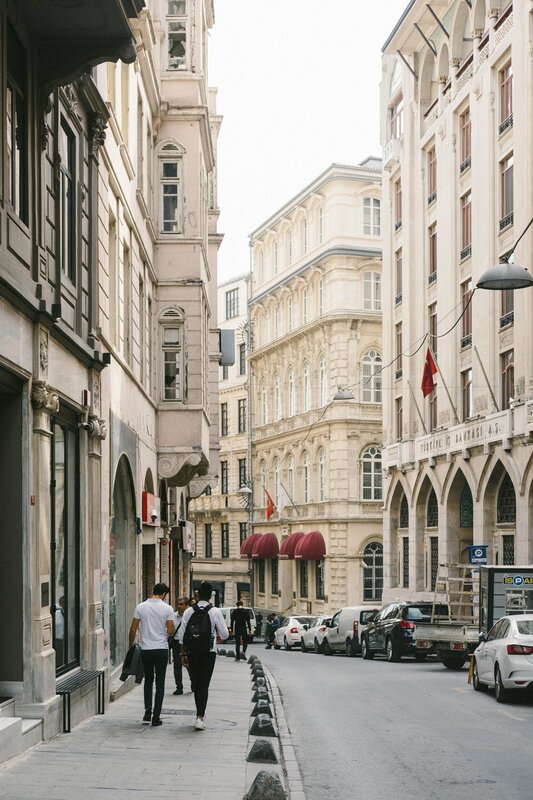 The street that ties these districts to Galata and Karaköy is Istiklal, a pedestrian-only thoroughfare lined with many shops and restaurants. It is also home to the famous “nostalgic tramway”, a historic rail line that runs all the way up to the square. Quite unfortunately, the rails were being repaired when we were there, so we didn’t get to see the tram. 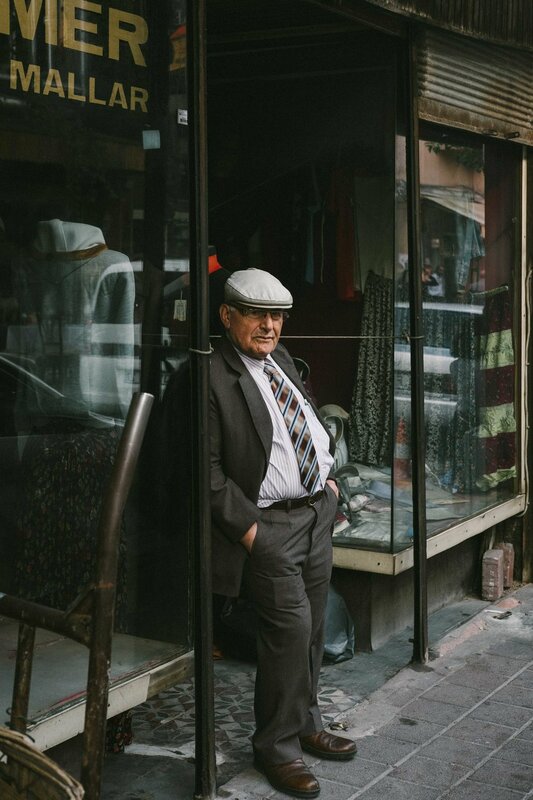 But during the time we stayed in that area, we would walk Istiklal all the way up to Taksim Square to get dinner and watch street performers, who would attract large crowds who clapped and sang along to popular Turkish songs. During our last night in Istanbul, we ate dinner at a restaurant adjacent to a fish market, where we could choose our exact fish and eat it fresh. This image of Taksim Square was taken from the internet, because I didn’t get a good photo of it. 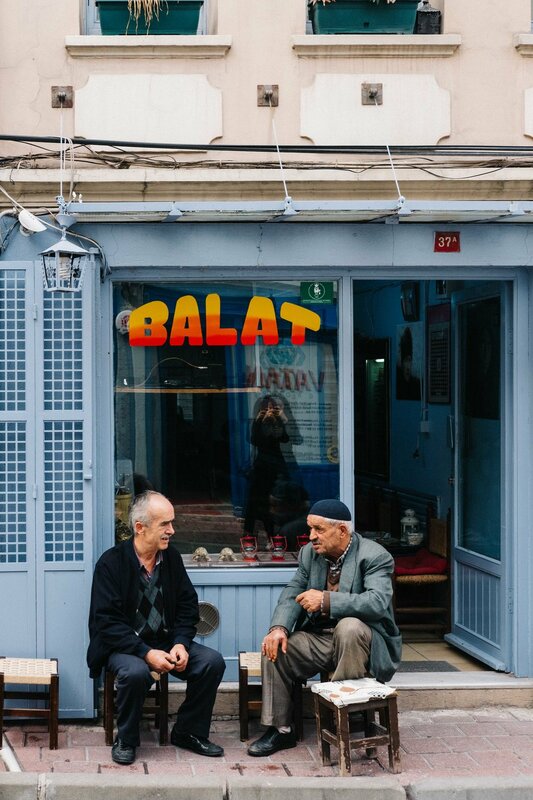 One of my favorite areas in Istanbul was Balat. It’s a primarily residential area, but also has a charming main street with lots of restaurants, cafes, and stores. Overall, it reminded me a bit of Williamsburg, Brooklyn. I wish we could have revisited Balat, but it was a bit out of the way, so we didn’t pass through it again. The neighborhood is quite hilly, and has some pretty colorful buildings. A short ferry ride away are the neighborhoods on the Asian side. One that I especially enjoyed was Kadıköy (not to be confused with Karaköy), home to many - you guessed it - cafes (Maybe I’m only remembering the cafes because it’s been so long since this trip happened, and we did hang out in a few. But I don’t even drink coffee!). Some of my friends from college happened to establish a coffeeshop in this area, and it was cool to visit, even though some of them had already moved back to the States. Other than the waterfront area, the Asian side struck me as generally more chill than the European side, especially in areas like Uskudar and the more inland parts of Kadıköy. It’s generally less touristy too, other than the Kız Kulesi, or Maiden’s Tower. While browsing Instagram, I discovered these rainbow-hued apartment buildings, and eventually, I found out that they were located on the outskirts of the city on the west wide, past the airport. It was a gated community, so we couldn’t go inside, but we were able to walk around the outside and take pictures of the buildings. We were fortunate to be able to meet or meet up with some new friends in the city, many of whom are pictured below. 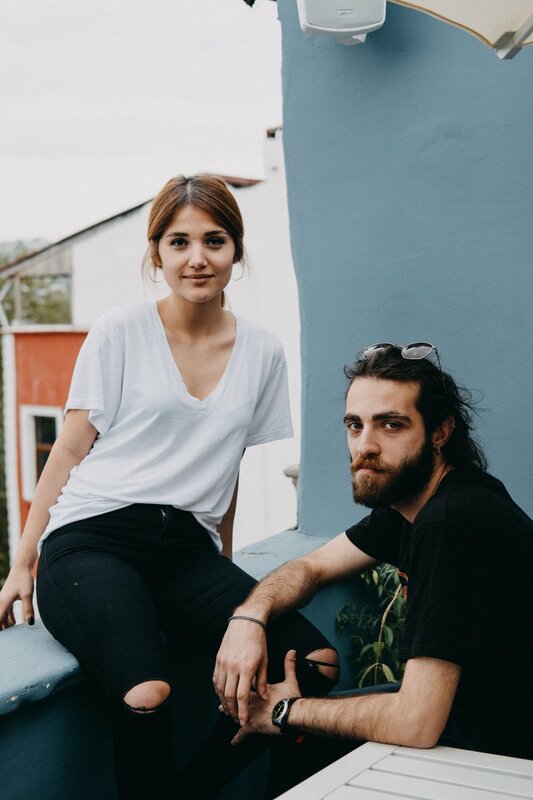 We met Gizem and Emre by chance, as they were sitting next to us at a rooftop seating area of a small restaurant in Balat. They are super laid-back and friendly people. Katie is someone I connected with on Instagram, and it turns out that her family lives in the Bay Area too. 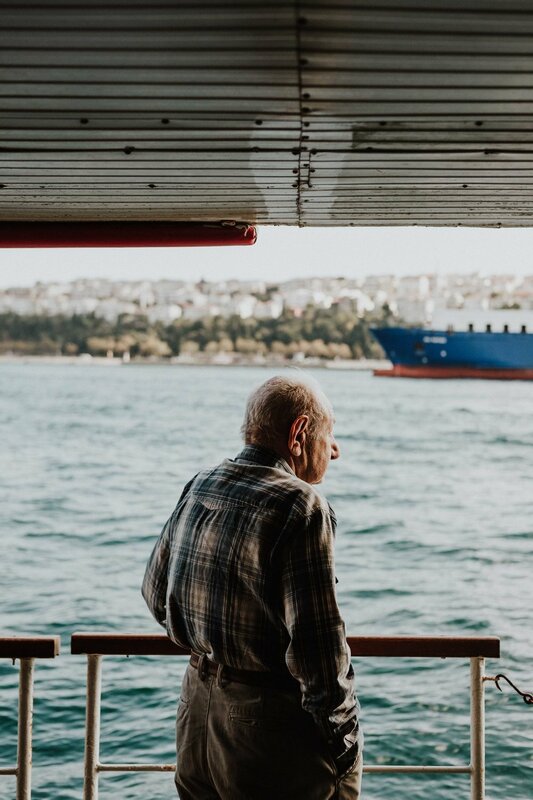 A writer and fellow photographer, she was kind enough to take us around some favorite spots around Kadıköy, including a super relaxing outdoor tea house. Another person I connected with through Instagram was Şeyma. She is a super sweet young lady who is also a photographer, and has a passion for linguistics. She took us around various places in Karaköy, including SALT Galata. 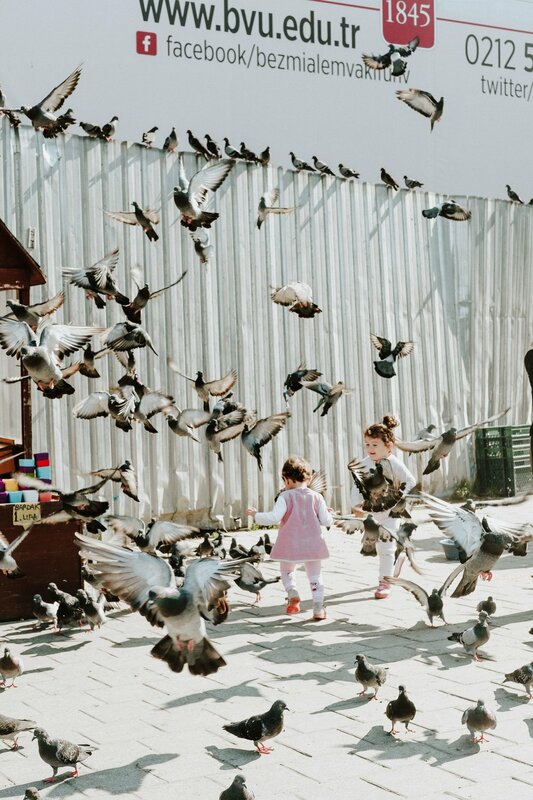 Another really cool photographer I connected with through Instagram is Beyza. She graciously led us through Balat and helped do some translation for me when I wanted to photograph some locals. I used Duolingo for a few weeks before I left to at least expose myself to the Turkish language. Even though I wasn’t even close to being able to carry on a full conversation (or even a full sentence), knowing key vocabulary words like thank you (teşekkürler), yes (evet), ok (tamam), and (ve), one/a (bir), and certain foods was helpful. I talked to my friend Kevin Embleton, who had spent a significant portion of his childhood in Turkey, and he informed me that fraudsters were a thing. I actually encountered some in the city who actively tried to defraud me, but I was able to extricate myself before committing to anything. It’s important to have cash on you at all times, as most places don’t accept card. My sister had an ATM card from HSBC, so withdrawing cash was a breeze. Taking the lightrail was pretty convenient, as it is quite fast and modern, and covers much of the city. We occasionally took buses as well. Google Maps and Transit are helpful apps to track public transit. Definitely get a SIM card while there. Nine days was quite a long time, but it allowed for a more relaxed itinerary. Even though we didn’t get to see everything, passing through some of the same places multiple times made them feel more like home, even though we were just visitors. Tarhan Uygur Restaurant. Oooohhh boy. We only got to eat here once, on our last day, but it was amazing. I wish we had eaten here more often. There was this one iconic shot I wanted to get: the view from the back of a ferry with the Turkish flag on the back of the boat flapping in the wind, and birds circling around. Unfortunately, I didn’t think of this until we were almost gone, and I wasn’t able to capture it. We weren’t able to catch a Whirling Dervish performance. When I made up my mind to go to Istanbul, I was envisioning, at best, an exotic Middle Eastern City that would make me feel like I was in Agrabah from Aladdin. I was expecting to be greeted with exciting human activity on every street, and traditional-looking building facades meeting my eyes, the smell of fragrant spices filling my nose, and the sound of laughing, singing, and conversing people, plus calls to prayer, filling my ears. Turns out only the last thing was accurate. Istanbul is a city that straddles Europe and Asia, antiquity and modernity. Most of the buildings looked plain and nondescript, and not very different from what one might find in most residential or commercial districts in Copenhagen, Berlin, Rio de Janeiro, or Delhi. The most middle eastern-looking buildings were definitely the mosques, and some of those (the ones that weren’t hundreds of years old) were quite plain as well. Because of this, I found that walking around, I had somewhat of a hard time seeing things that I would want to photograph, things that looked interesting or unique. Some of the stores and cafes we saw were what some would label as “hip”, and felt akin to similar boutique establishments in America. Because Turkey is officially a secular country, the dress code is not as strict as theocracies like Iran. Most young people wore “western” style clothing (and a lot of people were actually very well-dressed and fashionable), and didn’t look all that different from people I’d come in contact with in San Francisco, better, even. As for the smell, there are many smokers in Istanbul, so there’s that. My reason for traveling to any new place is that I’m looking for more places to fall in love with. Istanbul did not fully live up to my (perhaps unrealistic and uninformed) expectations, and I can’t say that I fell in love with it. 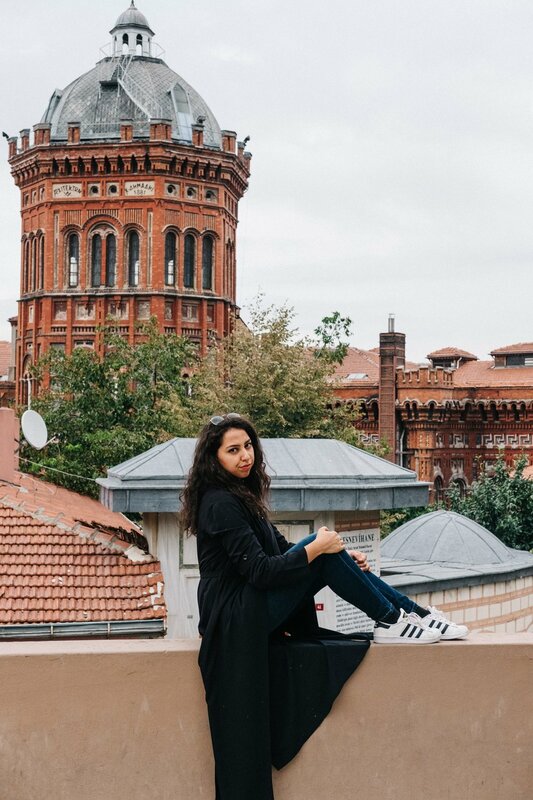 However, I still greatly enjoyed it, and when I am considering global locations for portrait/fashion shoots in the future, Istanbul would be pretty high on the list. Thanks for reading, and I hope this inspires you to discover new places too.